I love Mackerel in any shape or form, but I particularly love it cold in a salad. This is a fairly spicy dish so I’ve included a cooling yogurt dip and and some Feta to counter the spice on the fish – it’s a bit like the feeling you get with a kebab when you get bowled over by the chili sauce but just before you pass out the creamy garlic sauce kicks in and keeps you on your feet! Mix all of the above ingredients together and leave to chill in the fridge. This is really just another ‘arrangment’ dish: Mix the marinade ingredients in a bowl then cover the fish, leave in the fridge for about 20minutes – no longer. 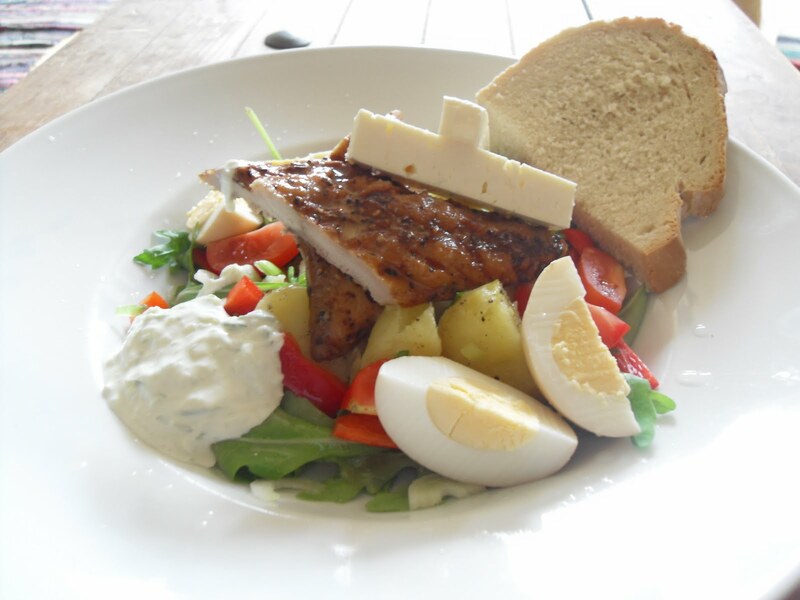 After 20mins take out and either Bar B Q or grill – arrange your salad ingredients as you feel (pic above) then set the Mackerel on top (either cooled or still warm), spoon on your yogurt and set the Feta on top.